Jesus then revealed the various signs that would announce the end times was near, and He used a few parables to further illustrate the day of reckoning, that three and a half years of wrath brought on by Satan and his army. When the Olivet Discourse was complete, and its impact felt by members of the Sanhedrin, they realized Jesus had to be stopped. So, they plotted to kill Him after the Passover feast, and when Judas heard about this, he offered his help in exchange for 30 pieces of silver, approximately $15,000 to $20,000. However, before Judas gave Him up for capture, Jesus used His last Passover supper to foretell one of the twelve was about to betray Him. After He predicted His demise, He transformed the Old Covenant, the Passover meal into the Lord’s Supper of the New Covenant, thereby creating a new feast known as “The Lord’s Supper” to be celebrated as God’s deliverance from sin. It was during this feast that Jesus told His disciples they were about to stumble and turn their back on Him, and He pointed to Peter and revealed to him that he would be among those who stumbled when He specified the apostle would do so three times before the rooster crows twice. But, what happened next is truly remarkable when Jesus retired to pray at Gethsemane, the garden the foot of the Mount of Olives in Jerusalem where olives were pressed into oil. The fact he went on alone in the garden is of significance however it was the prayer itself that proved to be mind blowing. Jesus begged God to take the cup from Him to avoid the pain and suffering to come. But, God said no, and after He caught his disciples asleep while on guard while He was praying, the Son of Man warned the apostles that His betrayer was near. A few minutes later, Judas Iscariot backed by a small army came to the garden to arrest and detain Jesus. After His arrest at Gethsemane, Jesus was taken to the High Priest’s palace where He faced members of the Sanhedrin, made of high ranking priests including Caiaphas, the High Priest, elders and scribes. It was at the High Priest’s palace, in the courtyard that Peter denied He knew Jesus 3 times before the rooster crowed twice, then morning came at which time Jesus faced Pilate and His accusers. Although Pilate felt Jesus was not guilty of a crime, he kept him in chains and eventually sentenced Him to death when the Jews demanded He be crucified. After over 600 men scourged and ridiculed Him, Jesus was to be taken to be crucified. Because He was weak and injured after a harsh beating, Jesus was unable to carry His own crossbeam to the execution site. When the soldiers noticed this, they conscripted a African man from named Simon who was the father of two of Christ’ disciples in Alexander and Rufus. The third hour meant 9:00am, the time when the Lord was hung up on the upright post where His feet were nailed, and the crossbeam suspended making up the symbolic cross. Six hours later, after much mocking and tremendous suffering, Jesus took His last breath and allowed Himself to die on the cross. When he received confirmation Jesus had been dead a while, Pilate released His body to Joseph, a member of the Sanhedrin who opposed Jesus’ condemnation so He could be wrapped in perfumed burial cloths and placed in a tomb owned by Joseph where He laid until Sunday, the first day of the week when Mary Magdalene, Mary and Salome returned to the sepulcher where they planned on anointing their Lord’s body with spices. When they arrived at the tomb, they noticed the large stone had been rolled away from the entrance, and Jesus’ body was gone. They were told by an angel to go and tell His disciples that He was raised from the dead, but instead they were frightened and went away saying nothing to anyone until, shortly after the Lord made His first appearance since the cross when He came to Mary Magdalene. She then revealed to many that Jesus had returned from the dead, but none believed her. He then appeared to more of His disciples, and after they also revealed they saw the Lord in the flesh, no one believed them either. Here, Jesus scolded the disciples for not believing what Mary and the two disciples had told them about His resurrection. The eleven included Simon Peter, son of Jonas, a fisherman from Bethsaida and Capernaum. James, another fisherman also from Bethsaida and Capernaum who was the son of Zebedee and Salome and the brother of John, who was also a fisherman. Andrew, a former disciple of John the Baptist was another fisherman from the same region, the brother of Peter and a son of Jonas. Philip was also a fisherman from Bethsaida, and one of the first disciples to be called upon to follow Jesus. Thomas, from whom little is known, lived in Galilee. He would be the one chosen by Christ to touch and testify the wounds on the flesh of the risen Lord. Bartholomew was a noble believer from Galilee, a scholar in the law and the prophets. Matthew, or Levi, the son of Alphaeus, was a tax collector from Capernaum. James, the “lesser” or younger, was from Galilee, the son of Mary and Alphaeus. He was the brother of the apostle Jude. Simon the Zealot was a Canaanite from Galilee. Jude, Thaddeus, the brother of Jesus, was also the brother of James the lesser and the son of Mary and Alpheus. Next, Jesus delivered the Great Commission, a command for all disciples to go out into the world and preach the gospel to all those who will listen and seek the hope that comes along faith in the Lord. Jesus then reveals the basis of salvation, that all those who believe will be saved from the wages of sin which is eternity in Hell. Lastly, Jesus calls on believers to trust in Him and through His divine powers, battle evil and heal the sick as each disciple crosses language barriers for the glory of God, and the furtherance of His kingdom. By faith, we are called to surrender to the Lord’s plan and advance the gospel. 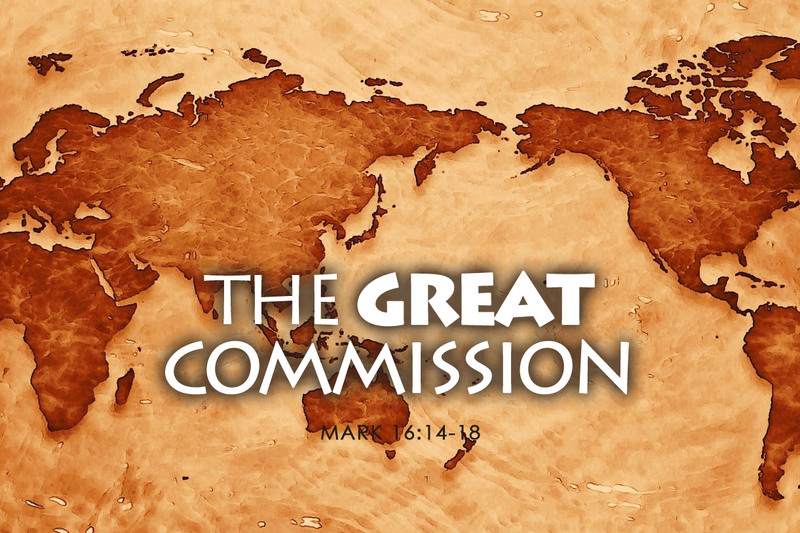 Ask yourself this: How am-I answering the call to the Great Commission? Let’s pray!